To view our current inventory of fine antique swords, click here! This Fine Sword Has Been Sold. 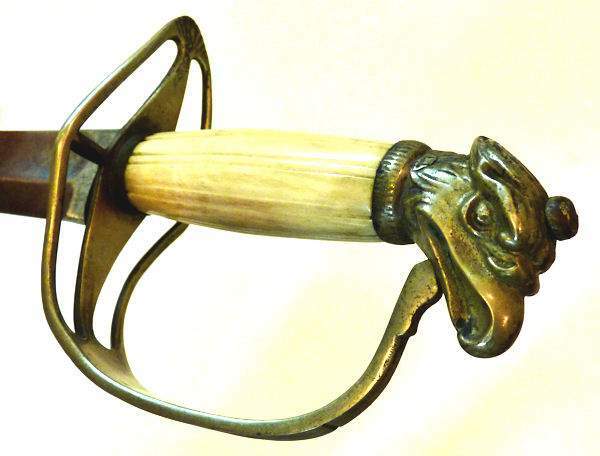 Presented is an eagle head saber which because of its pierced guard, is very rare. It was made for the American Market in England. It has a reeded bone grip which is in perfect condition, and a curved polished blade. 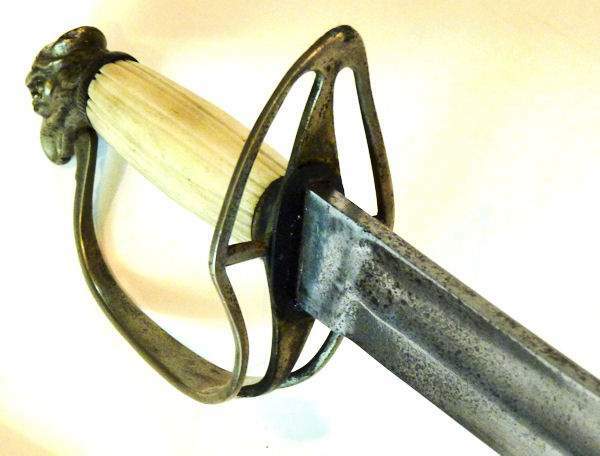 The hilt's cross guard has four open panels that extend into a sturdy stirrup guard that dates it to the Revolutionary and post-revolutionary period. Very few swords with this style guard have survived. The scabbard has a single suspension ring and original metal tip and throat with large throg button. They join a recently renewed leather sheath. The pommel is fitted with a Ketland style eagle in sharp detail with the tang extending in to a prominent capstan. The condition of the capstan and tight fitting hilt shows that the blade is original to the hilt. There is no looseness between the two. The workmanship is of very high quality. All the hardware has a silver cast and indicates that the saber is made from white brass rather than a silver wash which in itself is unusual. PROVENANCE: Purchased from a New England Estate. "Swords & Blades of the American Revolution" by George C. Neumann, Various. Ketland style eagle head is recognizable by its sharp features and flattened crest. THE BLADE: The moderately curved, single edge blade, with a single large, 22 1/2" x 3/4" fuller has been polished some time in the past. There are no markings. There is some minor pitting. THE SCABBARD: The black leather scabbard has its original hardware, but the leather has been refreshed so that it is like new. It is complete with its single mounting, including the tip all of which have a nice silver appearance. BRIEF HISTORY: The likelyhood is that this saber is from the English Ketland firm. William Ketland & Co. was active in Birmingham, England as a gun maker as early as 1780. The father and grandson, both William, had died by 1804 and the firm passed to a brother-in-law, Thomas Izon, who traded under the Ketland & Co., name until 1831 when operations ceased. Sword making by the firm dates from the earliest days of 1804 as part of Izon's success in dealing in the American Trade. He likely had help of family members, John and Thomas, living in Philadelphia and importers such as G. Upson in New York. DIMENSIONS: Length in scabbard overall 33"
Length of blade 32 3/4" Width 1 1/8 Thickness 3/16" Length overall 38"
International buyers welcome, but you are responsible for knowing the import laws of your country. We have satisfied customers in Argentina, Australia, Austria, Belgium, Bermuda, British Virgin Islands, Canada, Chile, China, Czech Republic, Democratic Republic of Congo, Denmark, Estonia, England, France, Germany, Greece, Holland, Hong Kong, Hungary, Iceland, Indonesia, Ireland, Israel, Italy, Japan, Kuwait, Latvia, Luxembourg, Malaysia, Martinique, Mexico, New Zealand, Nigeria, Norway, Nova Scotia, Panama, Philippines, Poland, Portugal, Puerto Rico, Romania, Saudi Arabia, Scotland, Singapore, South Africa, Spain, St. Maarten, Sweden, Switzerland, Thailand, Turkey, United Arab Emirates, USVI and the Eastern Caribbean.